Turning back to wood after the tie-dye fiasco we had much better success. My niece will be in town Labor Day weekend and for that special event I decided to unveil the new backyard to the entire family. 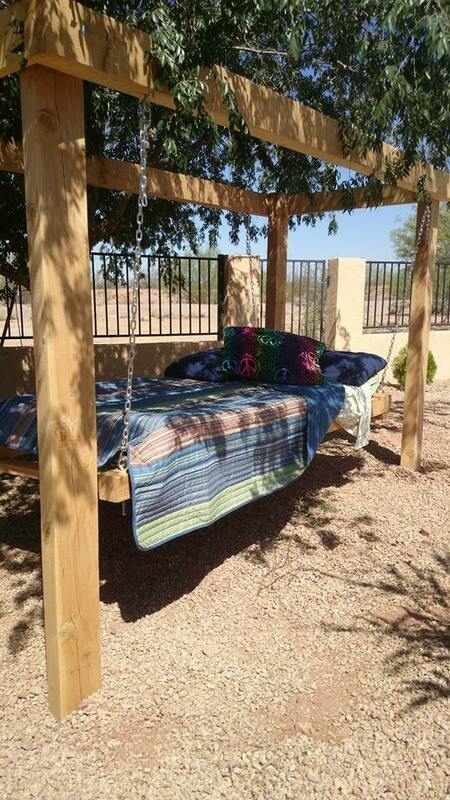 The only small problem with this is that the patio isn’t finished. I still needed a table and more chairs. This is a bbq event and it’d be nice for the family not to have to sit in the hot gravel. 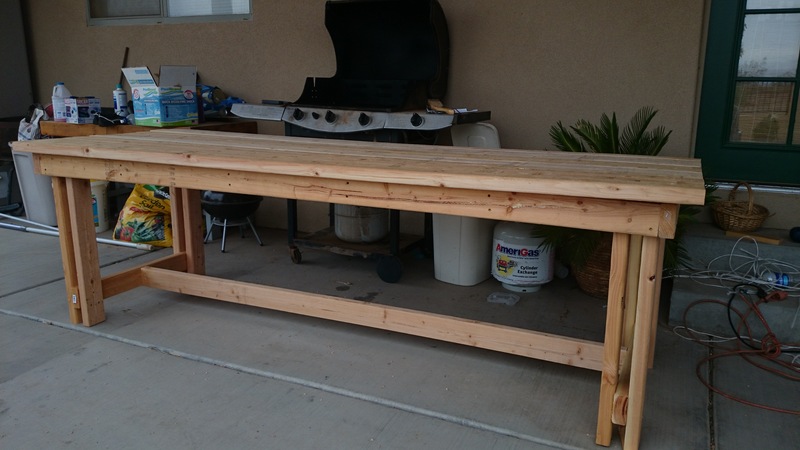 I also had wanted to build a cabinet around an existing old table, and a counter top for meal prep by the grill. 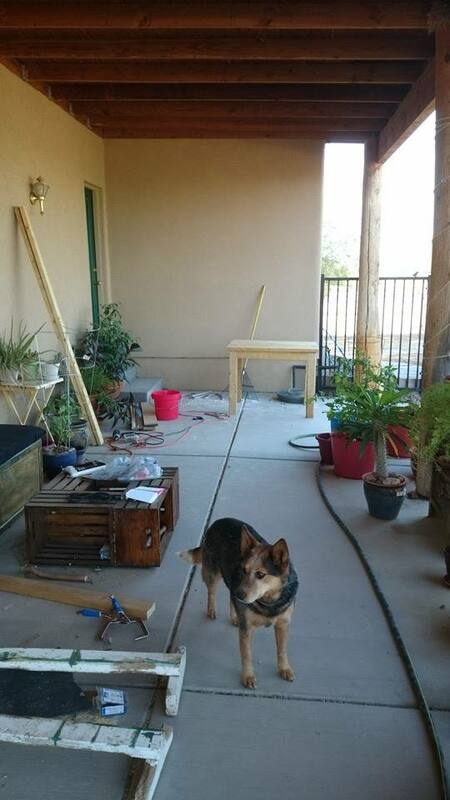 If all John and I had to do every day was dink with the patio all these things might get done in spite of the Arizona desert summer. Unfortunately, John doesn’t get enough time off, and it’s way too much for one old woman in this heat. Best we’re going to do is the table and more chairs. The rest will have to wait until the temps dip back down into the low 90s and preferably the 70s. We decided to tackle the table first. I’ve gotten so good with the chairs that I can whip out two a day by myself, even with frequent breaks to rest my back and hips. The table is too big a project for two hands and we wanted to succeed at something new to get that curtain out of our systems. 2x4s make GREAT, heavy duty, stand up to the test of time, furniture and they’re the cheapest wood buy out there. However, here are a couple of things we’ve learned about them: 1. They’re cheap because they are generally used where no one can see them and it doesn’t matter if they’re warped, twisted or bowed. You have to lay them down flat and be sure they stay flat on on four sides. You can actually go through a whole stack of 2x4s at Home Depot in order to find twelve straight boards. 2. Once you’ve checked them thoroughly for chewed up spots, warps, twists and bows, you need to use them within a very few days or they will get warped, twisted or bowed even in the dry desert. The table looked like a large, fairly complex project, until we saw the cuts laid out on the ground like this. These are the boards, cut and ready for an 8 foot table. Seriously. That’s it. 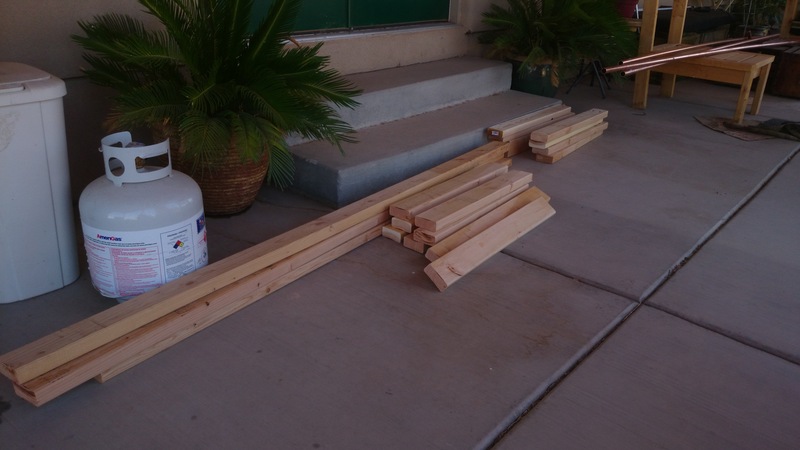 There are ten 8′ boards still in the garage, but if you get 8′ 2x4s you don’t need to cut them. 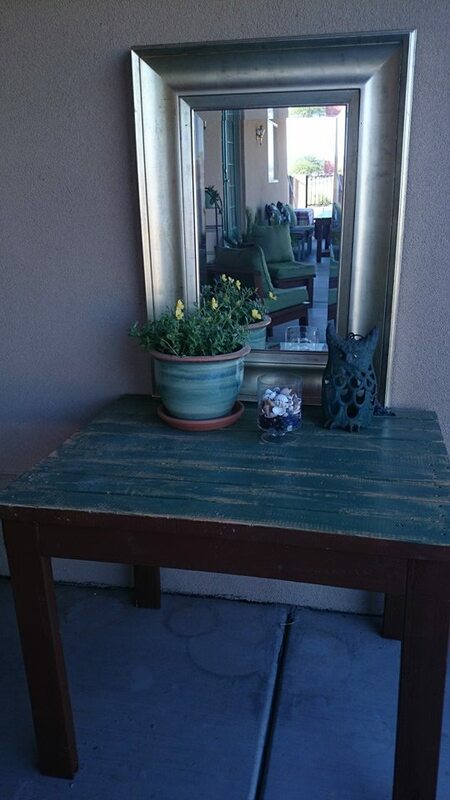 Because this table will be painted (I’m almost as sick of stain and urethane as I am of dye. ), I was not going to waste time with a ton of pocket holes. However, if you prefer staining pocket holes are your best bet so you don’t have to worry about screw heads showing everywhere. 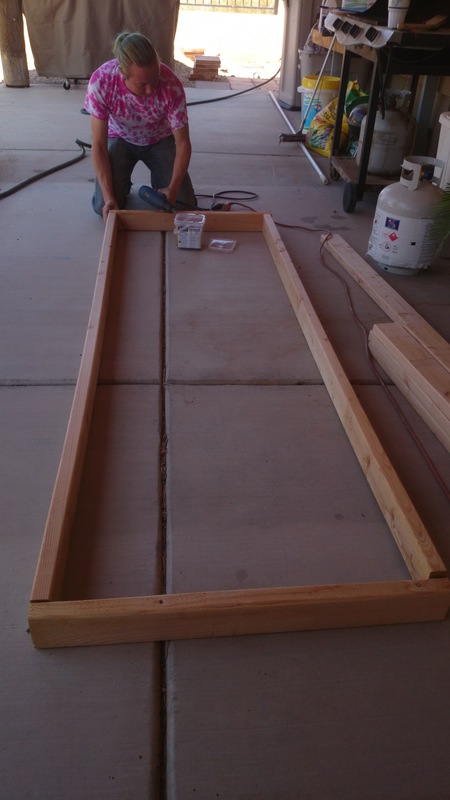 We began with a basic frame to hold the table top. Just a big rectangle with the side boards attached to the ends of the front and back boards. 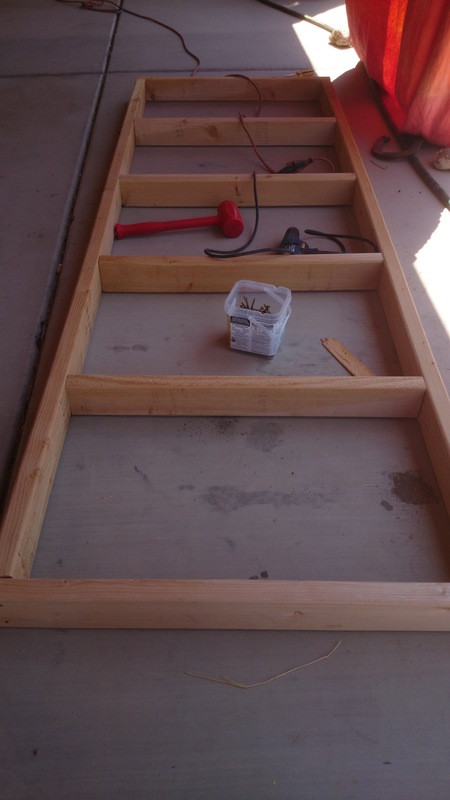 Into this outer frame, we added 4 support boards. The plan for this table calls for two legs at each corner. 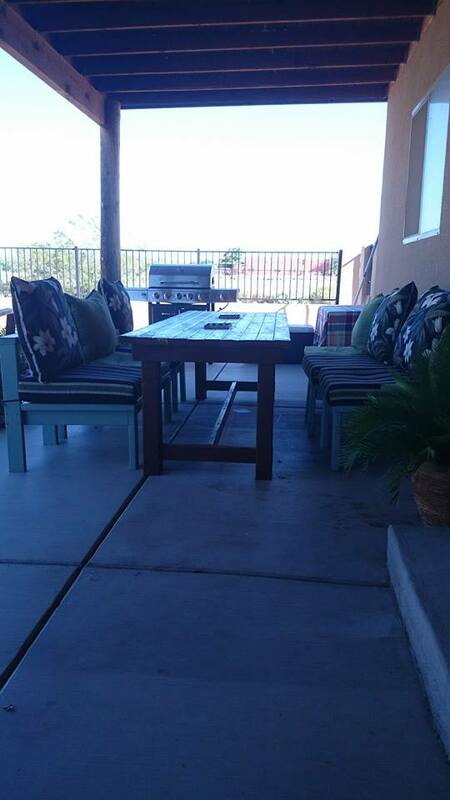 This adds to the stability when you find a team of percherons to drag this massive table from one place on the patio to another because it’s not about lifting it, and it also adds a bit of architectural interest to a simple design. Because the extra set of legs attach to the table top (this time we did use pocket holes) and to the leg support board, we added them to the frame last. 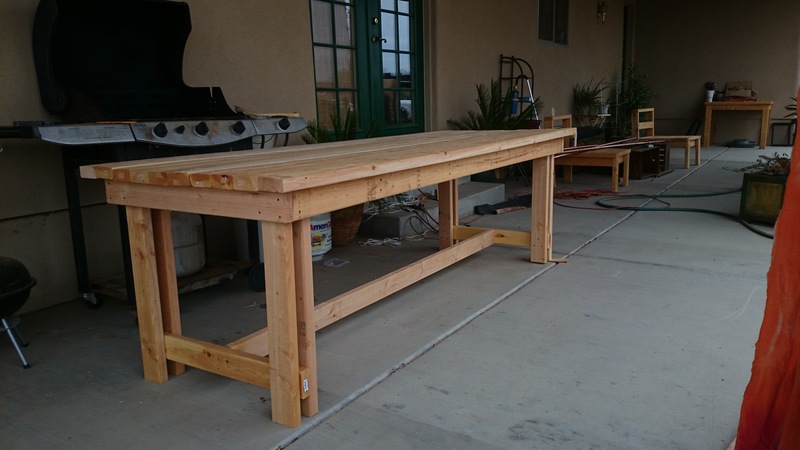 Once we attached the leg support board and the stretcher, we could attach the second set of legs, and all but the table top was done. 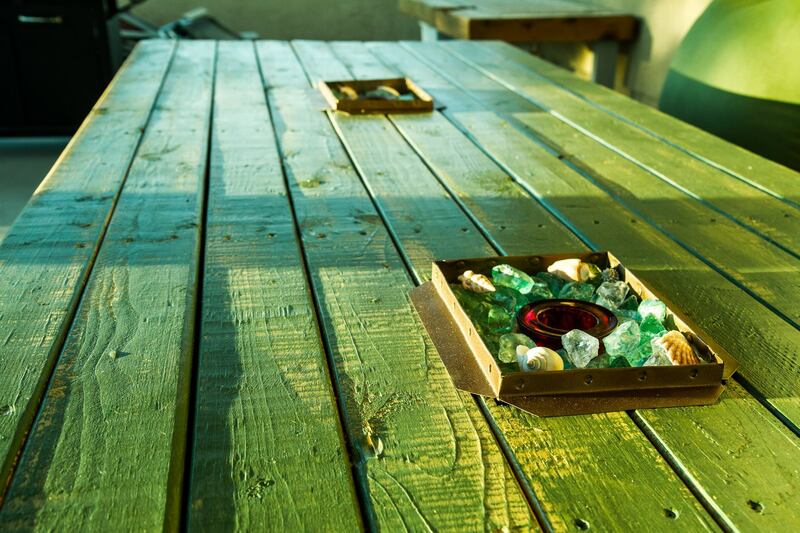 This shot of the table top part of the build is interesting in a couple of ways. 1. Like duct tape, baling twine has a billion uses around here. 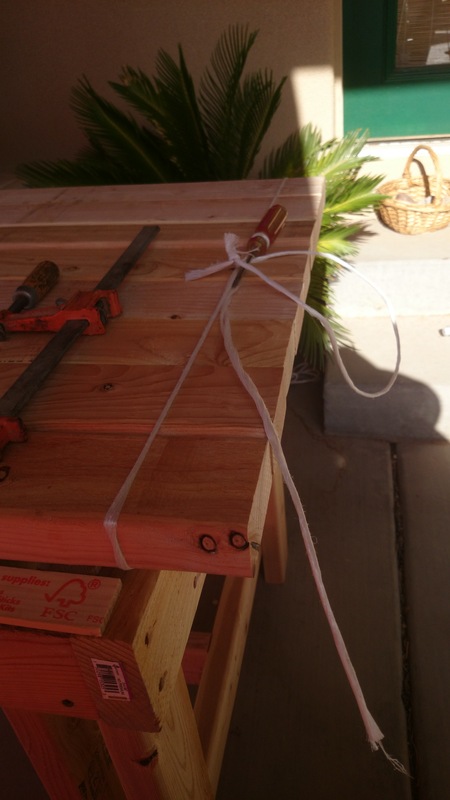 In this instance, it is being used as a simple twist style clamp to hold the boards together at each end so they could easily be screwed into the frame, and also because we waited too long to use these boards and a couple of them became slightly bowed to the side. This straightened them right up and kept them from moving while the boards were attached. 2. That legitimate store bought clamp you see on the left was used to tame the boards that were twisted and warped when we left them in the garage for a couple of weeks after purchase. 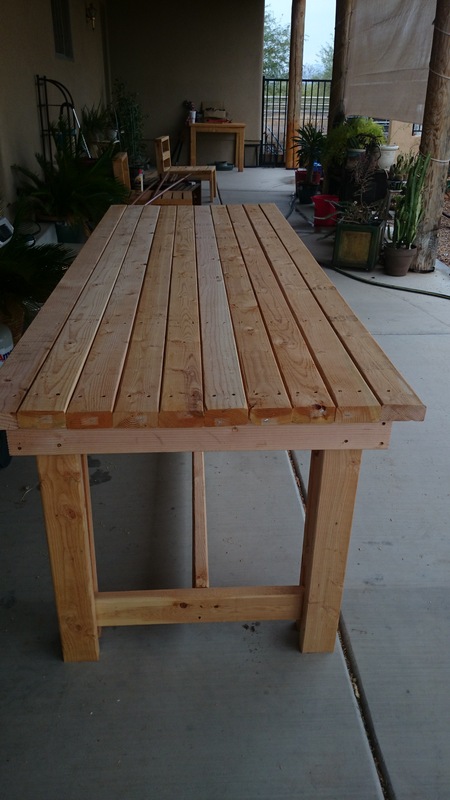 Because there was little room for the boards to attach at the outer edge of the table top, we did drill pocket holes about every 15 inches so that the boards could be attached not just to the frame, but to the adjacent boards as well. 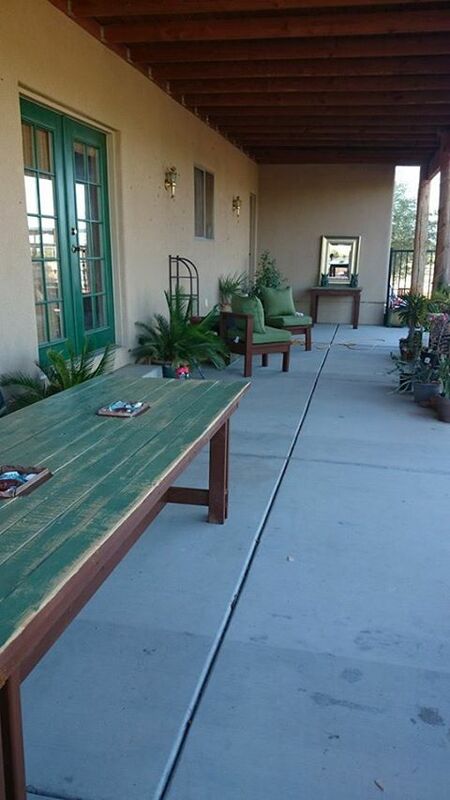 Several views of the finished table. Once the chairs are completed all the wood furniture will be sent to the barn where we will learn how to use the paint sprayer. 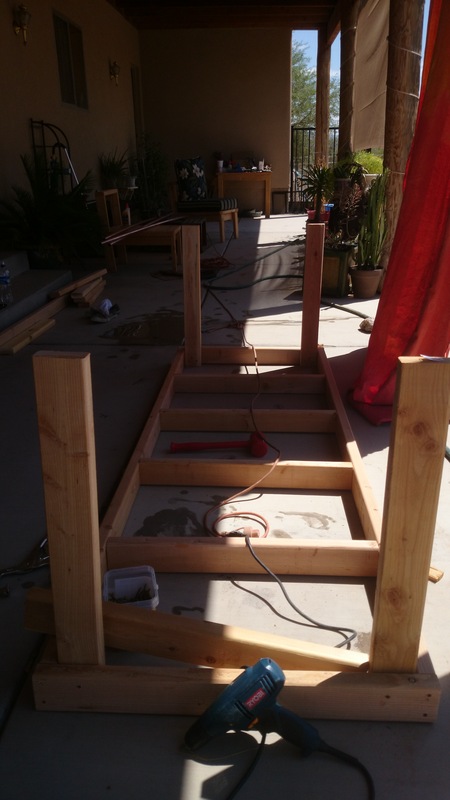 We got a late start on this table which added to the heat exhaustion problems. Because apparently aliens have developed an insatiable taste for 2 1/2″ screws, John had to run to town for a bucket load and we didn’t start cutting until a little past noon. The patio temperature had us both running and dunking in the pool every time our clothes dried out which was about every 20-30 minutes. I personally guzzled 3 liters of water and a gigantic fountain diet coke in 4 hours and still got a heat headache. In spite of plastering spf 80 sunscreen on my skin, I still managed to burn red, or I guess it could have been bake red. But, in spite of the heat we managed to get this table done from cutting to ready to paint in a little less than 5 hours. That’s how simple it was. 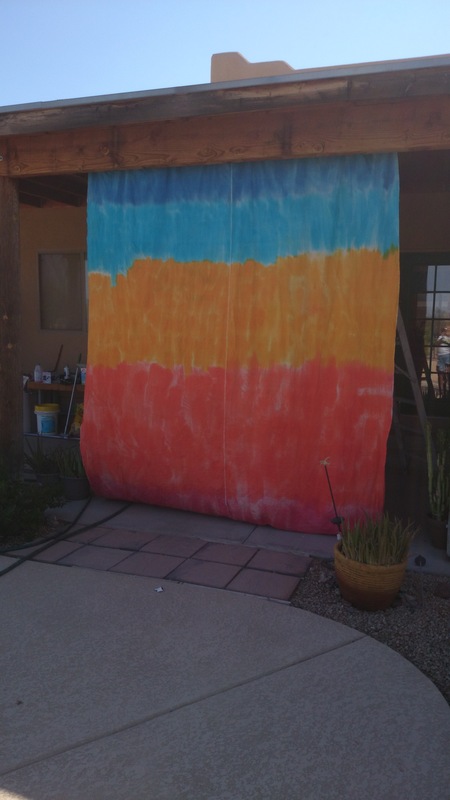 Tie-dye (sort of) Patio Curtain, semi-fail. It has been brought to my attention that I haven’t posted to the blog in a while and that observation would be correct. I live in the desert. It’s summer. The only place I have to build the furniture is on the large, west facing patio (aka the oven) that collects heat from noon onward. 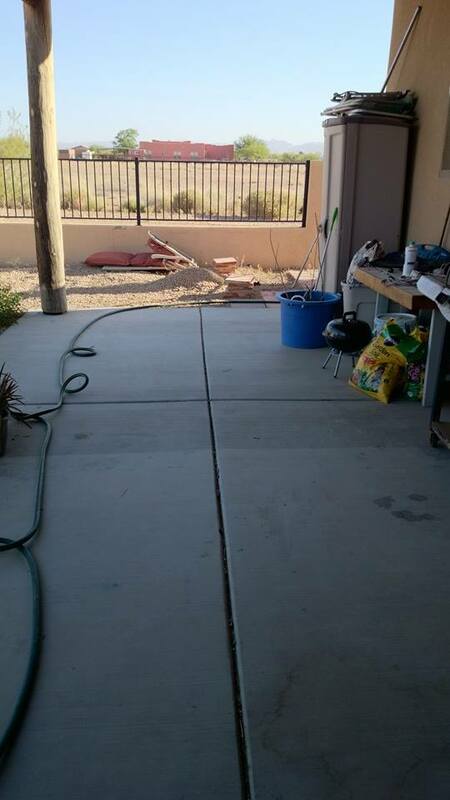 When it’s 110 degrees, that patio hits 130, bacon, eggs and pancakes can be made on the cement slab. Not even constant dunks in the pool and 80 spf sunscreen can prevent heat exhaustion and burns. So, yeah, not much to blog about here, but we did suffer through two projects, three if you count one monumental fail. John and I began dabbling with tie-dye to make ourselves some shirts. While I was Googling tie-dye patterns, I came across a multitude of other tie-dye, dip dye, sponge dye and every other kind of dye method you can imagine. They all made the process sound so easy and the results were wonderful. 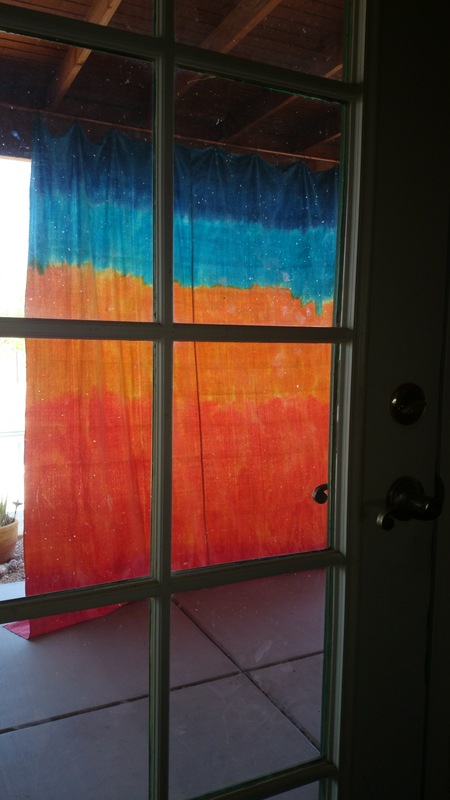 One project for dip dying curtains really attracted my attention. Because that gigantic patio faces west and collects enough heat to bake pottery, I’ve been trying to figure out a way to add shade. With my need for cheap project materials I’d decided to use the large cotton drop cloths that can be found in the painting supply sections everywhere. I’d had this idea many years ago and should have acted on it then. Several years ago there was such a thing as a cheap WHITE cotton drop cloth. By white, I mean WHITE. I should have stocked up. I should have filled closet shelves with them. The lesson learned here is that if you find well made materials (or anything else) that you have a use for or may have a use for in the next few years, get them. The one thing that we can apparently count on is that what is well made and inexpensive today, will not be as soon as someone figures out how to make it cheaper and charge more for it. There are no more plain white cotton drop cloths any more, anywhere. They’re all a drab oatmeal color. I can only assume that manufacturers have stopped bleaching the fibers to save time and cost. At the same time, however, these drop cloths have doubled in price. Gee thanks. 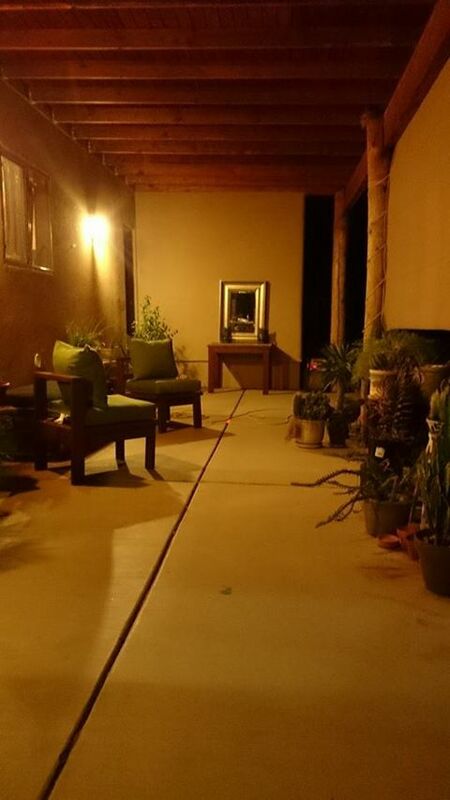 I bought enough oatmeal colored drop cloths to cover each of the 12 foot spaces between the columns on my patio. I then proceeded to bleach the heck out of two of them. They require fairly large buckets of which I only had two to spare. 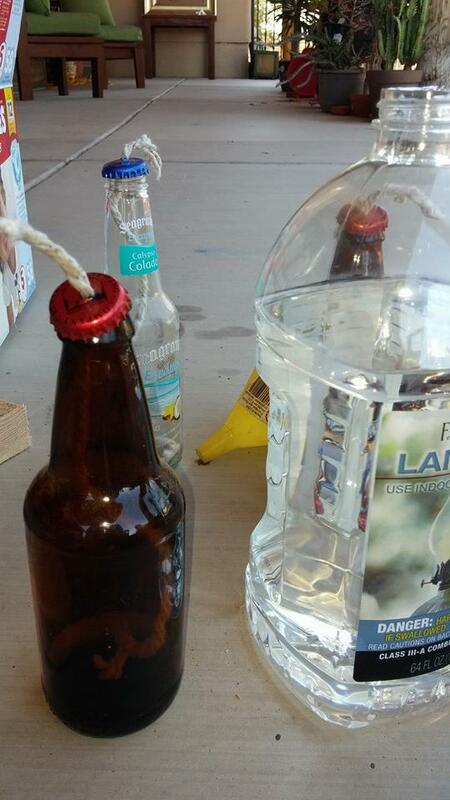 I let them both soak in a half gallon of bleach mixed with 10 gallons of water, for two days, in the sun. Are they white now? Heck no. The best of the two turned a very pale oatmeal. The worst, a light shade of gray, even after washing and rinsing several times to remove the bleach before dying. Using the very pale oatmeal cloth, and following the instructions for Rit dyes, I set up buckets with my dye colors and dunked a section of the cloth in each color. 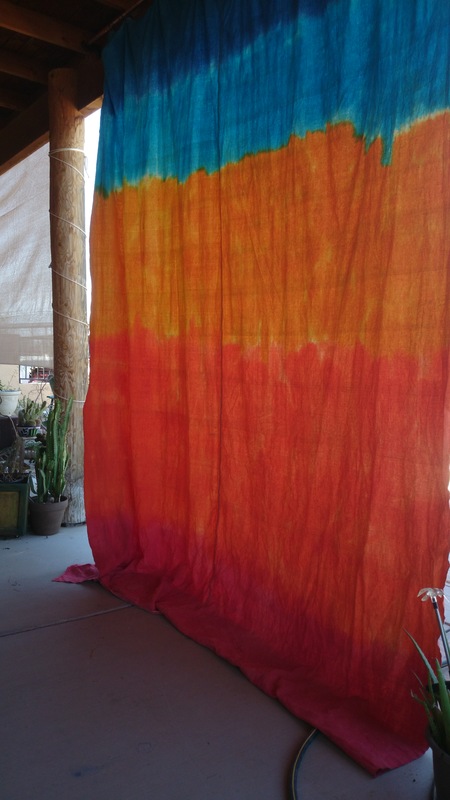 Stretching the cloth out like a scrunchy cloth snake, over a line of buckets, and pushing each section down into the dyes allowed for several inches of space between colors so the dyes could spread up a bit between colors but not mix together. I let the cloth soak in the dyes for an hour or so while I tie-dyed some kiddie clothes and some little white 5.00 sneakers I’d found. I then squeezed out each section of the cloth and left it over night. The colors were vivid, a bit too vivid. I made the mistake of hoping it would fade a bit in the wash. I hosed off the extra dye and then put the cloth through the washer and dryer. Boy did it fade. What were once true colors when they came out of the dye, faded and muted to the point that they were unrecognizable as the original dye colors. Completely unsatisfactory for cheerful breezy patio curtains. As I was screeching about the monumental waste of time and money with Rit dyes, a couple of friends suggested using Procion mx dye with soda ash. Guaranteed to give vibrant color that stays that way. I ordered some. Not only is it more expensive than Rit, it also comes in tiny jars with no more than a few teaspoons of dye powder in them. I used several jars of each color just for one curtain. The amounts were so small, that there was no way to dip dye. 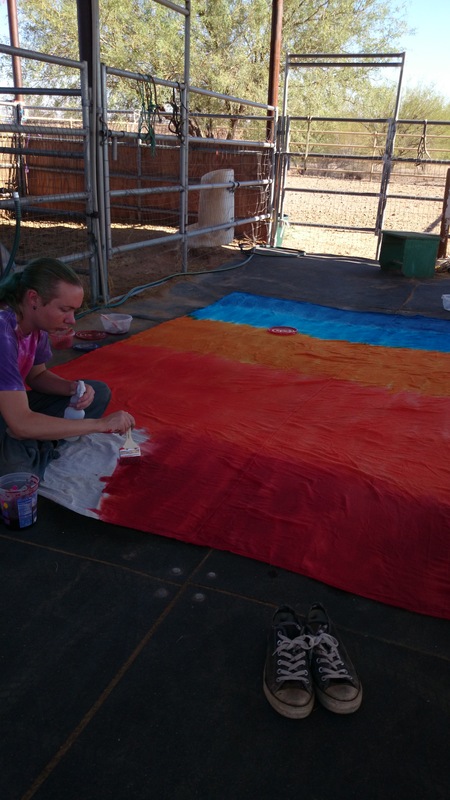 We soaked a cloth in the soda ash water, hauled it to the barn, spread it on the rubber mat aisle between stalls and painted each color on with paint brushes. Carefully folding the cloth in 4ths so that only like colors touched, and then placing garbage bags between folds to prevent different colors from bleeding onto each other, we folded it up and shoved it into a garbage bag to let it sit for a day and a half. We then hung it over a stall fence and proceeded to rinse it with hoses until the water ran clear, before we washed and dried it. It was bright after we dyed it, bright after we rinsed it and holy merde is it bright now. I can only count the second curtain as a semi-success. I’d been going for a water color sunset effect, but got something that looks more like a vibrant, rainbow beach towel. I will not be making one to match. The others will be dyed a solid color as soon as I can pick a color and get enough of it to dye 3 more curtains. I’d managed to wallow around on the ground for two stripes before I got too coated with dye, too hot and was in too much pain to continue. John finished up my stripes and his. I’d not suggest you try this if you have bad hips, bad knees, bad shoulders and a bad back. After letting it sit for a day and a half, we hung it over the pony wash rack fence to rinse it. This is AFTER the rinse. 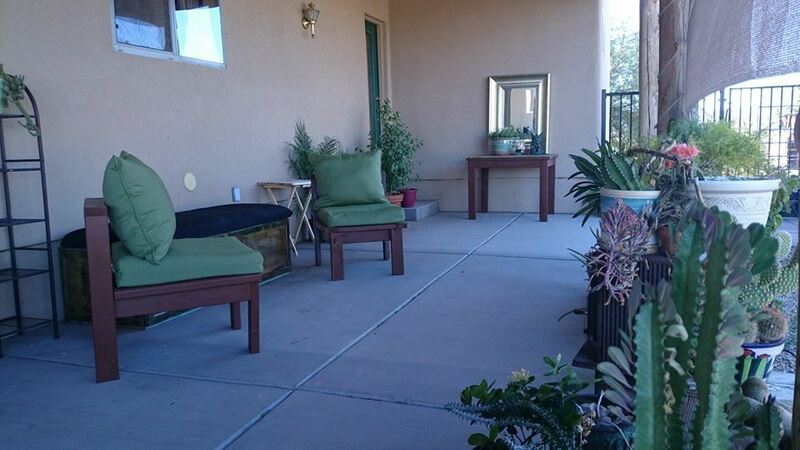 This is how it looks from the covered patio side with the sun shining through it. Definitely cheerful and it does indeed provide shade. But from the outside, we have the world’s largest beach towel. 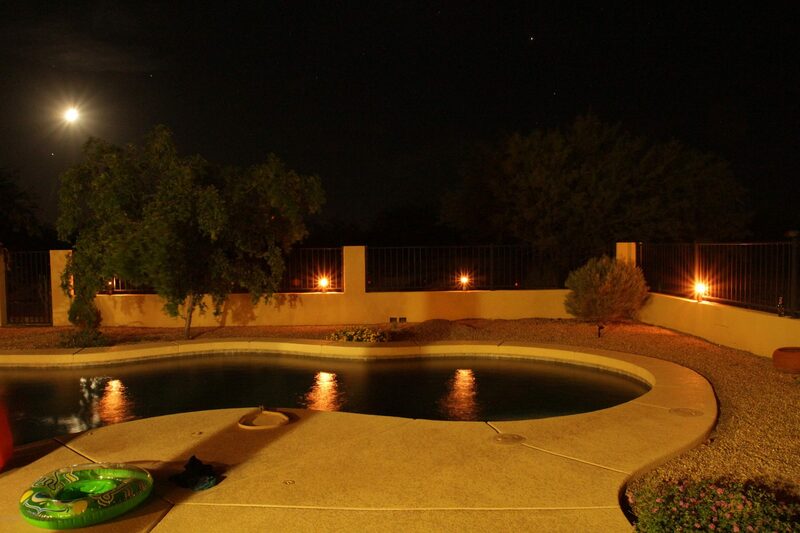 I suppose it’s sort of appropriate since this is the pool side view, but not what I was looking for. This is my view from inside the house. Umm, yeah, the others will be solids. This may one day become a colorful shade for horse stalls. 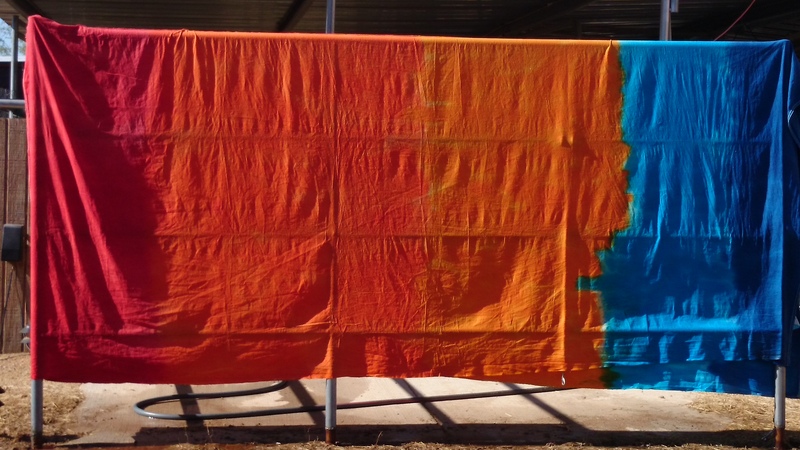 One giant beach towel which may end up as a barn shade, one very muted curtain that will definitely hang as a barn shade, and a large blue splotch on the parking pad that looks as if a Smurf met it’s doom (the tarp we were using apparently had a hole. This is why the operation was moved to the barn aisle). I am not without tools, William saw to that. We have tools that I had when I was a single Mom, tools that William bought throughout his years of home ownership, and a lot of the tools his father had collected. 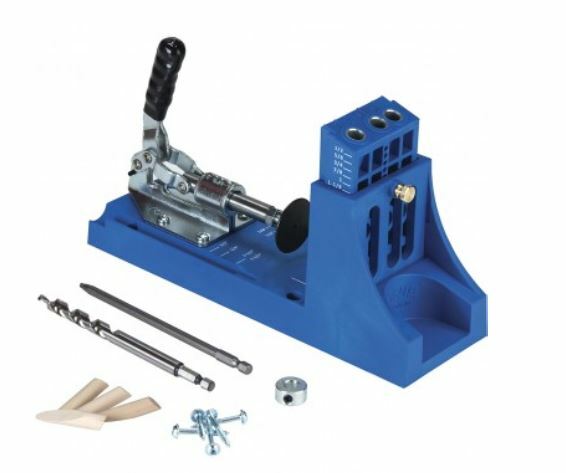 We have hand saws, table saws, drills, sanders, grinders, a tile saw, drill press, a collection of screw drivers, hammers, and wrenches of all descriptions. We are not tool poor. There are quite a few power tools, however, that we have simply done without because we had the hand tools. For Mothers Day this year, I made my sons shopping chores easy for them. 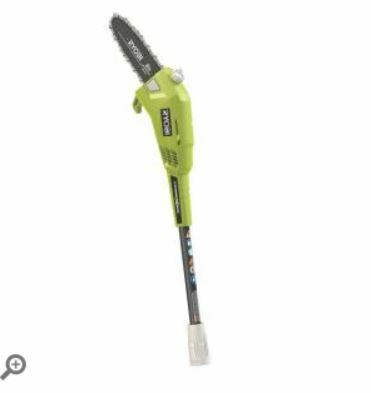 I gave them a list of tools that would have made William’s home improvement life easier and will now make my DIY life and yard work easier. 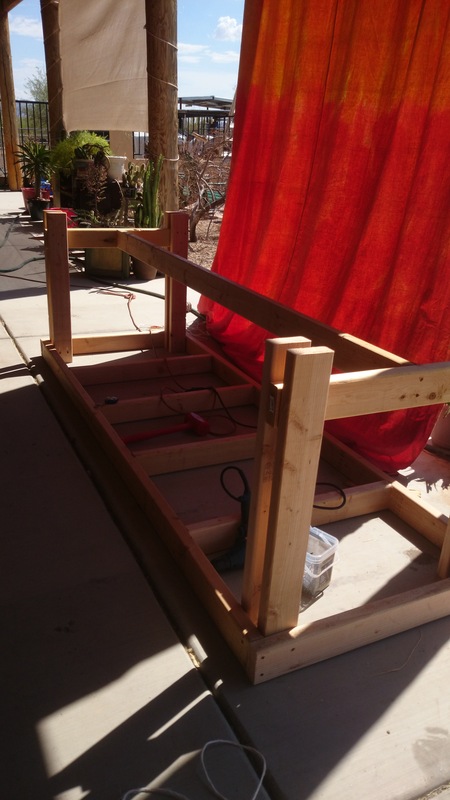 This Kreg Jig K4 kit has already allowed us to make headway on the arms and back for the swinging bed, and will make building the frame for the next planter boxes and storage bench much easier and neater. This kit is available at Home Depot, but Home Depot doesn’t carry any of the nifty clamps that make pocket hole work so easy. Lowes has a better selection of accessories and screws for this jig. 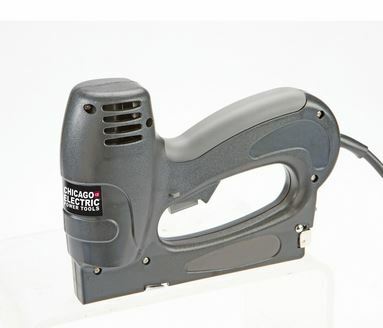 This Chicago Power Stapler is great for all the projects I have planned which require upholstery. I used it to upholster the top for the storage bench and it drove the staples in straight and fast. No bent staples to remove! There is a trigger safety lock and the tool weighs less than 2 lbs. so it was easy for my old lady hands to use. This stapler came from our local Harbor Freight. I love chocolate as much as any chocoholic Mom, but I’ll take tools that save the time and strength I don’t have over a Whitman’s Sampler any day!.